This dining experience happened nearly a month ago and I’m just now getting around to writing about it. Since returning from Hawai’i, I feel like there’s been a certain amount of delayed reality to my entries, probably due (at least in part) to a very heavy work schedule. That said, I’m trying to get caught up. 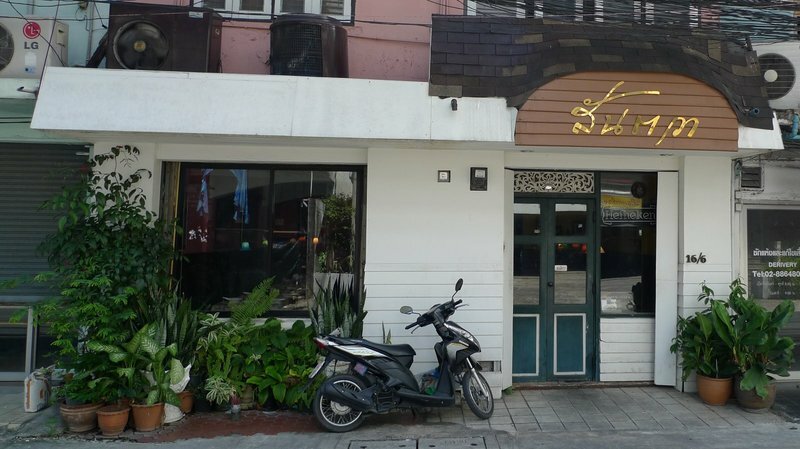 A few weeks back another Singaporean friend invited me to join him for lunch at Santawa, a classic Thai restaurant located on a soi, or alley, back behind the Bangkok Bank headquarters on Silom Road. We set a date for a holiday so the streets were very quiet as I walked in the blazing sun to the restaurant. The restaurant itself is quite well-hidden, despite being right on the street. There is no English-language sign (and I was working from the English spelling of the name, not the Thai spelling) and even with the sign it is still sort of nondescript. In fact, I almost walked past it and Kelvin saw me and ran out to catch me before I wandered away. Santawa has been a fixture of the Silom / Narawathiwat area for decades. Its primary lunch crowd is local housewives and the proprietress usually ran the show from a designated table near the front of the shop. Lately, it seems, her health is declined and she is no longer coming in regularly. Everything else, though, seems to continue unchanged. 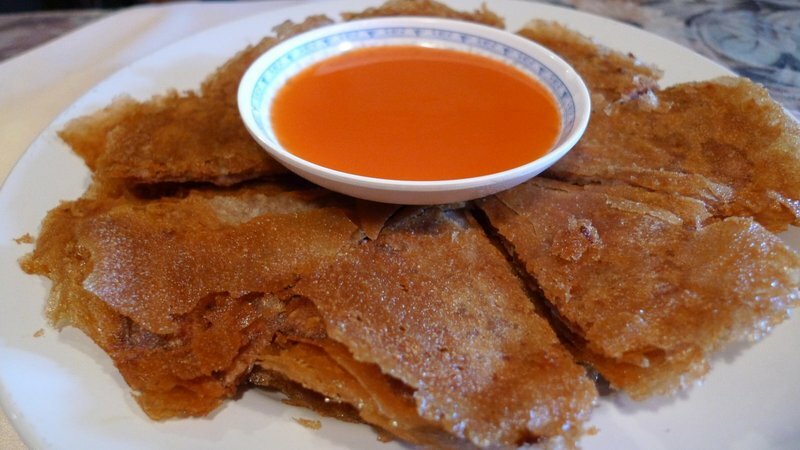 Goong gra beuang – Crispy fried multilayered pancake with fresh shrimp and a sweet chili dipping sauce. Not the highlight of the meal, actually. 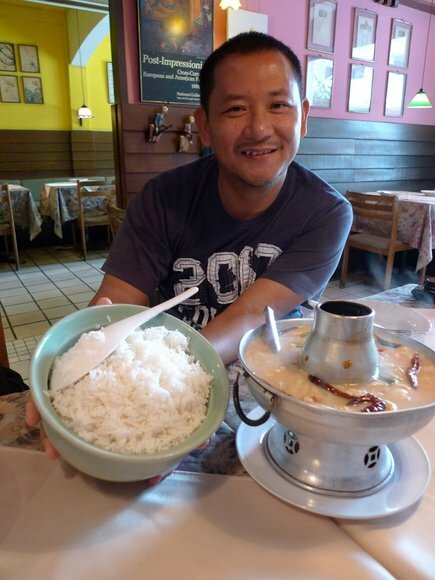 Tom kar gai – a coconut-milk based soup that is usually quite mild and bland. In fact, it is often used as an early food for children. As you might imagine, it is quite popular with foreigners. However, I was pleasantly surprised that the broth had a very complex flavor and it was really, really good. Kelvin initially thought that Tawn would be joining, making four of us including his Thai friend. However, Tawn was unable to make it. When I arrived, Kelvin and and San had already ordered so we had massive quantities of food. Rice, anyone? Yam makeua yao – Grilled eggplant served in a sour sauce with ground pork on top. This is one of those dishes that is a mainstay here in Thailand but is regrettably uncommon in Thai restaurants overseas. Soulfood Mahanakorn does a neat version of this dish that uses bacon instead of ground pork. Santawa’s original, bacon-less version was still very nice. Panang curry with pork and heaps of basil leaves. 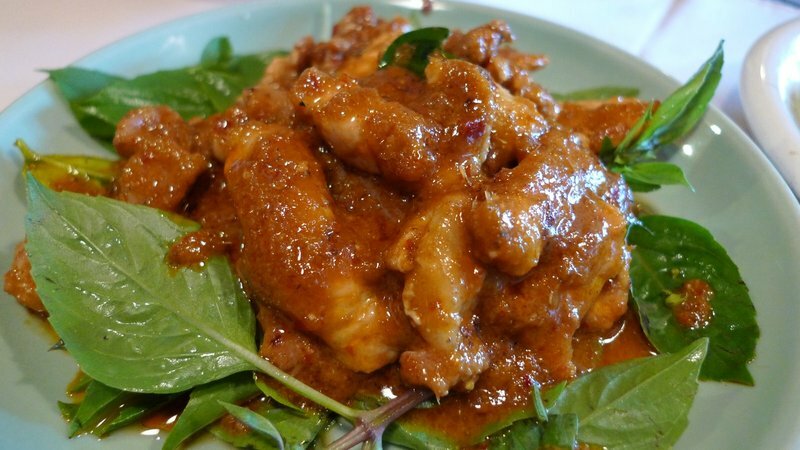 Panang is one of my favorite types of curry and it, along with Massaman curry, is generally a more accessible type of curry for those not accustomed to Thai-style curries. 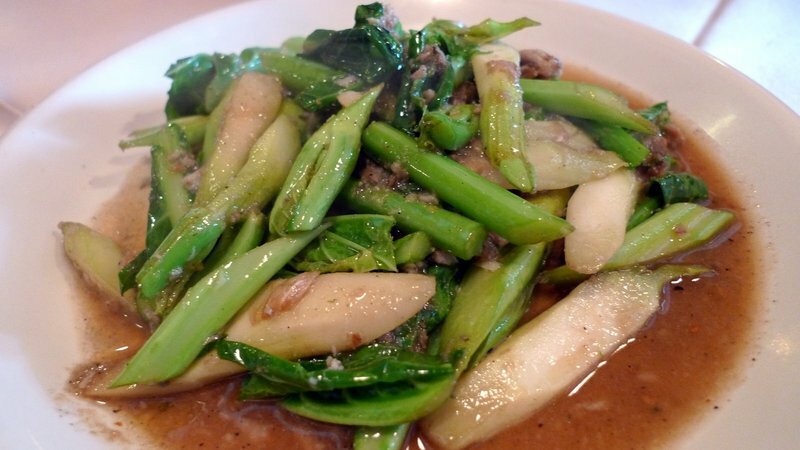 Stir fried greens with a salted fish sauce. Clean, simple, and satisfying with lots of umami. 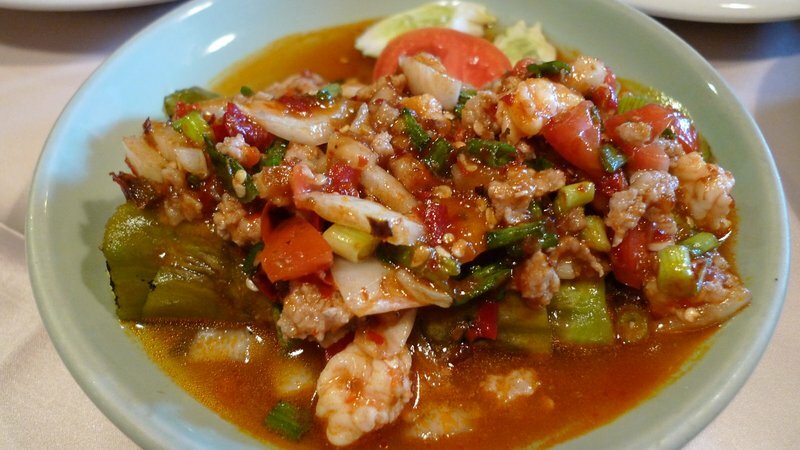 Salted and fermented fish and shrimp are common ingredients in Thai cooking, not to mention the near-ubiquitous fish sauce, which adds a certain something-somthing to the dishes that, if not added, taste a little flat. 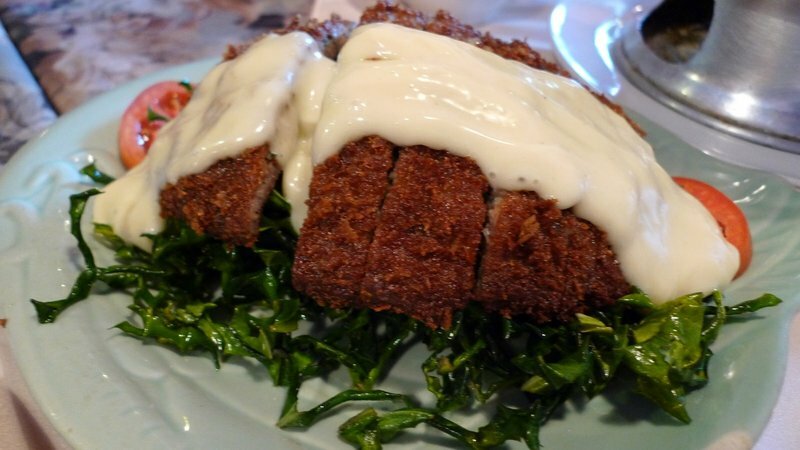 The final dish, one I have never had before, is a duck breast, pounded, breaded and fried, served on deep-fried kale leaves with a mayonnaise like sauce. It doesn’t look as good as it tasted, so you may just have to take my word for it. All in all, the restaurant was a pleasure, one of those bits of old Bangkok that have somehow been caught in a time warp and (thankfully) fail to keep up with the times. 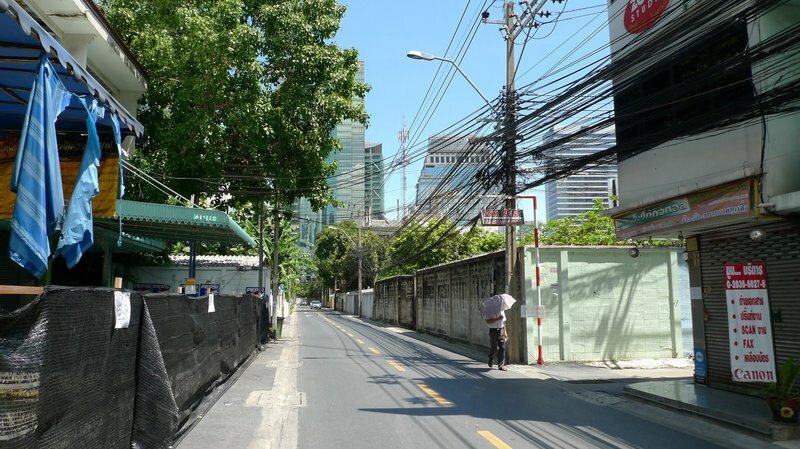 This entry was posted in Uncategorized and tagged Bangkok, Dining, food, Krungthep, Restaurant, Santawa, Silom by christao408. Bookmark the permalink. Your food commentary reminds me of how I (and probably a lot of Americans) am in a food rut… there are so many possibilities out there. Beautiful shots. Tell me..how do you deal with the lanquage barrier ? Love the dishes.M loves Penang curry and I like the Massaman curry. The Massaman curry ( I am told ) was originally eaten by the Muslims ( known in India and the East as Mussalman ). Gradually the ‘l’ in the word became silent and people all other meats to the curry besides lamb or beef.The pictures look great. looks great.love salted fish.the duck breast looks delish!!! The last one didn’t look like it was of duck breast but it does look good. I’m glad you had a good time there. Wow, all those dishes look super good. I have to say though, u have a good eye for capturing food shots. It really makes your entries that much cooler! the pork and curry looks so good! I love duck and you can be sure I would have ordered it!! I was just thinking about how much I would like to return to Thailand and how no Los Angeles Thai restaurant comes close to the food from there. These photos brought it all back again. Anthony Bourdain Jr? 😉 The photos are quite lovely. So did you write down the names of what you ate, or did you really recall it all from memory? This is making me hungry! >.<It all looks really good! Yea i too was thinking Anthony Bourdain onTravel Channel. Very lucky you are experiencing all these great looking dishes. 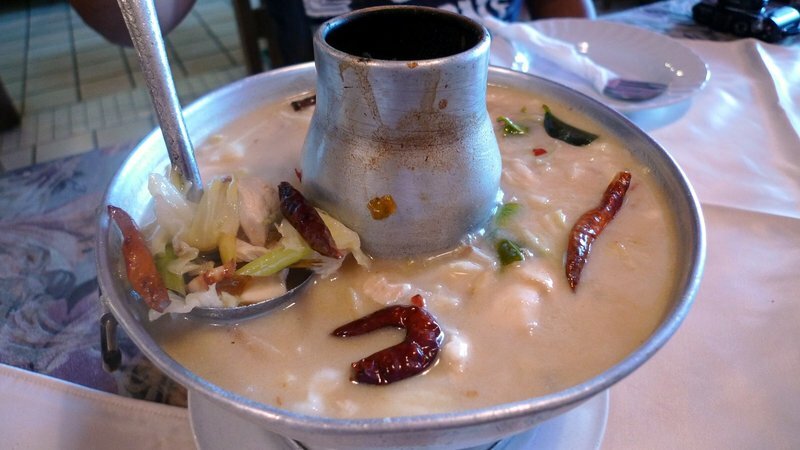 The soup looks very interesting – is it very thick? J and I had Thai the other day. Maybe we ordered the wrong things or the kitchen had an off night. The grilled snapper tasted frozen and was a bit dry. @The_Eyes_Of_A_Painter – I speak, read, and write Thai very proficiently. Understanding can sometimes be an issue if colloquialisms are used, though. @ElusiveWords – Not very thick as if thickened w/ tapioca starch, but definitely not watery, either. Sorry to hear you had a bad eating experience! @Passionflwr86 – This is the conversation I had with a friend recently. If I were to go back to the US, I would miss the readily available healthy and inexpensive “fast” food that is ubiquitous in Asia. (And, for that matter, many other countries. )@CurryPuffy – Yeah, we can go there. It is an interesting place. They kind of make their own hours, though. @NVPhotography – And “green” hot is REALLY hot! Thanks for the rec. @ZSA_MD – I think you are correct. The Massman curry is very much associated with southern (i.e. Muslim-predominate) Thailand. @nov_way – It is definitely an unconventional preparation for duck breast. @armnatmom – Actually, I recalled from memory but did double-check w/ the Singaporean friend to make sure my memory was correct. @crazysogul – Gosh, nowhere near as [fill in adjective here] as Bourdain, although I enjoy his show. @Ricardo98 – Thanks for the reec. I’d argue that nearly no Thai restaurant outside of Thailand seems to be able to recapture the flavors. Speaking of LA, though, what Thai restaurant would you recommend there? Have you been to the Thai temple’s Sunday market? @yang1815 – Salted fish, stinky tofu… LOL@ThePrince – Well, thank you. I have to say that the camera I have does a really nice job in a variety of conditions, which helps. Also, I spent some time learning how to make better use of the aperature-priority feature and macro focus, both of which lend a lot to food photography. @Randy7777 – @Pysia89 – @bittersweetreflections – @Fatcat723 – Glad you enjoyed the entry. Wish this blog had smell- and taste-o-vision. LOL@Inciteful – Glad you enjoyed the entry. Thanks for the recommendation. I noticed that the Tom kar gai had chillis on it. I think I would love the taste of it, but I was wondering if it is really suitable for children since it is a bit spicy?